So, yesterday, I published a blog post telling you all about my experience with the personal shopper at House of Fraser. The majority of my readers are women of a similar age to me, and likely to be on a similar (well, for their sakes, IÃ¢â‚¬â„¢d hope better!) salaries. Single women, no responsibilities, disposable income. Great target audience if you’re, I don’t know, a large retailer trying to sell clothing and other items. IÃ¢â‚¬â„¢m not usually the sort of person to say anything at the time, but I believe that if something happens to you Ã¢â‚¬â€œ both good and bad Ã¢â‚¬â€œ then you should tell someone. IÃ¢â‚¬â„¢ve emailed companies before if IÃ¢â‚¬â„¢ve had amazing service, because people should be rewarded! I thought it would be polite to say to House of Fraser what I had written Ã¢â‚¬â€œ seems silly telling you lot and not the people concerned! I received a polite email back, saying that unfortunately the website contact bit could only deal with website queries, but theyÃ¢â‚¬â„¢d pass it on to the Bristol store. About an hour later, I received this email from my WordPress, saying that there was a comment to be moderated on the personal shopper post. Well thats embarrassing. hof.co.uk, redirects, as youÃ¢â‚¬â„¢d expect to the House of Fraser website. For a company who, lets face it, probably would like all those 20 somethings coming and spending their disposable income in store, this is quite a cockup! Social media, such as blogs and Twitter, is quite an important thing in terms of advertising these days. Within 5 minutes of posting the above picture on Twitter, IÃ¢â‚¬â„¢d had lots of replies from people saying how disgusted they were. Perhaps theres a really good reason for this. House of Fraser, I canÃ¢â‚¬â„¢t wait for your reply! Update: I’ve had a reply back from the womenswear manager at the Bristol store about the original reason for the blog post – you can seeÃ‚Â her response on the original post. Update (2) A follow up to this post can be found here. That’s awful! I can’t believe that this person from House of Fraser could be so daft to think it wasn’t traceable. 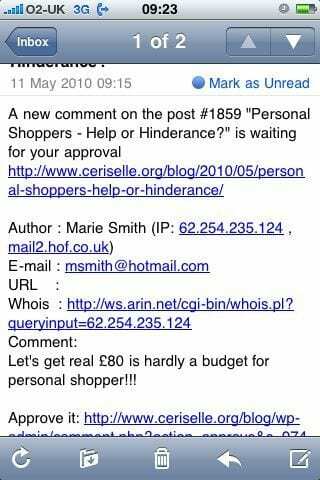 If they don’t want you only spending Ã‚Â£80 they should post it – personal shopper free if spending over Ã‚Â£x or Ã‚Â£10 otherwise etc. To have some random staffer pretend to be a blog reader is just dumb & shows little understanding of WoM marketing or the internet. Epic Fail. HAHAHA!! Bloody brilliant. Fail, fail, fail on so many levels. Good luck explaining your way out of this one Marie! This is a poor, poor show from HoF – I never really shop there anyway but this has put me off venturing in, and actually it’s put me off the whole personal shopper experience which I’d always been wary of as I assumed you would have to spend Ã‚Â£Ã‚Â£Ã‚Â£’s (though this is contrary to the advertising) but guess HoF proved me right! this is such a fail on their part and so so so rude! does it really matter how much you have to spend, i think Ã‚Â£80 is an acceptable ammount to spend! this is so rude, I’m glad they have been caught out! I’ve worked in retail all my life and if there’s one thing that really annoys me, it’s poor service and snobby staff. Thanks for sharing this with us all! I really hope that HoF deal with this in a suitable manner. Not in an infantile way like this. I’m so shocked – I’d be nervous enough of judgement before I used a personal shopper service, without having some snooty biotch treating me like something she stepped in for something as subjective as my budget. Ã‚Â£80 can buy you plenty – it says more to me about what an unimaginative personal shopper she would be, than it says about you. I really hope that you at least get an apology for this. Oh dear! How embarrassing for them!? That’s just not cool in any way – its definitely put me off. I’ve retweeted as well, just so you know. I would just like to point out to Ms Smith, that if that was me, I would make a big deal about Ã‚Â£80 because in real life my budgets are well lower! We have responsibilities when you buy your own home and have a car, and to top it off, don’t earn as much you or still stay at home with the parents. Money doesn’t grow on tree’s and when someone uses your businesses service, because it is available to them, respect them, because at the end of the day it’s us paying your wages! Isn’t the point of a personal shopper to find you suitable clothes in your budget??? House of Fraser have lots of departments where they should be able to find an outfit for Ã‚Â£80 and surely with the current economic climate the shoppers should be trying to save their customers a bit of money, a few small sales are better than none at all! Wow, I hope that employee is suitably disciplined, not only for using company internet for social use (I doubt reading blogs is company policy) – maybe if she spent more time doing her job, she wouldn’t think Ã‚Â£80 was such a small budget! My budget for outfits stretches to about Ã‚Â£20 if I’m lucky! Wow…that’s awful! I agree with previous comments about personal shoppers. A good personal shopper can work with ANY budget! The ones at House of Fraser are obviously not that great if they are willing to shun a sale because the customer is working with a realistic budget. I hope the woman from House of Fraser sees this and feels ashamed of herself, and who knows, maybe someone higher up in the company will see this and realise that their staff are rude and representing the company badly! That is hysterical, what a complete twonk. I’m sorry but Ã‚Â£80 is very reasonable to me! Even if Miss Smith thought otherwise then surely any good personal shopper would take that as a challenge! I’ve always shied away from personla shoppers as I thought they’d be snobby and rude, glad to see my expectations held up. Well done House of Fraser, that’s one more customer you’ve lost. This is ridiculous – what a blunder for HoF! I can’t believe that staff member was stupid enough to leave that comment. Personally, I don’t have a very large clothes budget, as James & I are trying to save up for our future (how very grown up!). If I had a special occasion to attend, I would consider spending Ã‚Â£80 on a new outfit ‘splashing out’, and would probably consider going to a personal shopper for some advice on what kind of dress would suit my body shape best. The level of service that the HoF staf member gave you was shockingly bad, and this comment is even worse! This story puts me right off the company. Wowser, they sell some expensive clothes. Just don’t shop there, they are clearly mad. Good luck with everything, let’s see how HOF tries to dig themselves out of this hole! Also wanted to add that Ã‚Â£80 is more than enough for a new outfit! Honestly… the cheek! Wow, how utterly unproffessiona and dare I say it, laughable. What would she gain from writing that? From someone who used to work for HOF, Ã‚Â£80 is a decent amount for a personal shop. I saw you mention this on Twitter earlier today, I can’t believe the experience you had. I always assumed the reason that high street stores included these services was to make them accessible to everyone, not just people with thousands of pounds to spend. I used to work in retail, and part of my job was to provide a personal shopper service. The demographic was slightly different, but the principles were the same: provide excellent customer service. I’m amazed that the personal shopper didn’t take the time to find out what you actually wanted. Sometimes time can be an issue, but even taking a couple of minutes to find out your likes/dislikes can make a big difference. Building a rapport helps to make it a more positive experience. Budget should not have been an issue. It doesn’t matter whether you want to spend Ã‚Â£1 or Ã‚Â£1000. The service should be accessible to anyone, and anyone who chooses to use the service should be given the same level of respect. The role of the personal shopper is give you ideas about things that suit you and that you feel happy in. There should be no obligation to buy, and the customer should never feel pressured, or made to feel uncomfortable. I appreciate that providing a good personal shopper service is hard work, and does take a lot of time. However, if you put the customers needs first, then it generally pays dividends. Sometimes customers don’t feel like buying; other times they will spend a lot more than they normally would. Word of mouth is the best advert for service. Marie Smith and HoF would do well to take note of this fact. Talk about an epic fail, House of Fraser! That is utterly ridiculous. As for Ã‚Â£80 not being a lot of money… In these times of economic crisis, it bloody is a lot of money. I worked in retail for over two years and l loved it if a customer came in with a bit of a challenge for me. Turning your nose up at customers is rude, unprofessional and downright ignorant. Without customers, you don’t have a job. Hope you get somewhere with this, Hayley! So they stock high street brands but you’re not allowed to use their personal shopping service if you have a high street budget? How ridiculous. I NEVER go in HoF as I’ve always perceived it to be too expensive and apparently I was right! clearly house of Frazer pay their staff too much! I had a similarly crap experience at HoF personal shopping. I wanted a dress for a wedding, and specifically wanted a dress that was young and trendy but not too fitted as I’m a bit self conscious. I said I didn’t want anything too expensive. I also said no prom style dresses as I already had one. What do I get? Only Karen Millen fitted dresses for Ã‚Â£150 and prom style dresses! I have a sneaking suspicion that she might have been after commission. Call me cynical. There was also no discussion of what might suit me, which to be honest was what I had thought was the point of the whole thing. In the end I bought nothing and got something myself from Warehouse the next week. What a waste of time. Wow, what a horrible experience! I agree Ã‚Â£80 is a perfectly reasonable budget for an outfit, particularly if it’s “going out” clothes that don’t have to stand up to the same wear and tear that everyday stuff does, nor be worn as often. Her attitude was utterly rude at the time, and then to get such a snooty comment from someone at HoF… appalling, I’m rather pleased I never shop in there! Me and my mate Phil went to Primark the other day looking for “a surprise” for his lady. In the Cambridge branch we encountered Rosie, who personal-shopped us for a budget of Ã‚Â£9. Good work Primarni, bad times HoF.